Shortly after receiving his MFA from Florida State University, in 1978 Jack Reilly moved to Los Angeles to pursue his career as an artist. Reilly’s paintings were discovered in 1979 by prominent Los Angeles art dealer Molly Barns, who offered him a solo exhibition with her gallery. That same year, curator Donald Brewer of the Fisher Museum at the University of Southern California introduced Reilly’s new work in a major museum exhibition entitled The Reality of Illusion, which opened at the Denver Art Museum and traveled for two years to the Oakland Museum, USC Fisher Museum, Johnson Museum at Cornell, among other institutions nationwide. This series of museum exhibitions established Reilly as one of the original members of the Abstract illusionism painting movement. In 1979 Reilly received a National Endowment for the Arts Grant. By the early 1980s, Reilly’s paintings were represented by galleries in major American cities including the Molly Barnes Gallery in Los Angeles, Aaron Berman Gallery in New York, Foster Goldstrom Fine Arts in San Francisco, Marilyn Butler gallery in Scottsdale and numerous others. Articles and reviews on Reilly’s paintings were subsequently published in Arts Magazine, Art Week, the Los Angeles Times, New York Artworld, and in books including American Art Now by noted author and art critic Edward Lucie-Smith, and Inside the L.A. Artist by Marva Marrow. Such notable collectors of the era, including Fred and Marcia Weisman, Steve Martin, Daniel Melnick, and numerous other private collectors have acquired Reilly’s paintings. In the 1990s he was commissioned by the County of San Diego to execute a major forty-foot, site-specific, wall sculpture/painting for their public art program. An eighteen-foot shaped-canvas painting was later commissioned by American Airlines at Los Angeles International Airport. In 2012, the Bleicher Gallery in Los Angeles presented a solo exhibition of Reilly’s new paintings, as part of the Getty’s Pacific Standard Time initiative, Art in L.A. 1945-1980. Continually active as a painter, widely collected and exhibited internationally, Reilly’s work can be found in numerous private, public and corporate collections including the Oakland Museum, Atlantic Richfield, American Airlines, and Verizon Communications, among others. 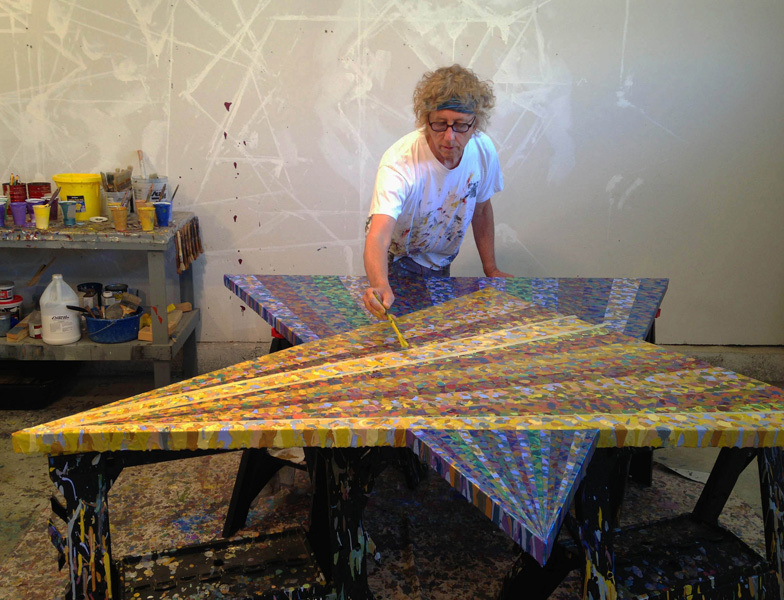 In addition to Reilly’s long-standing career as an exhibiting painter and professor of art at California State University, he currently divides his time living and working in Hawaii and California. A few months after receiving my MFA in December 1977, I moved to California. I bought an old Rambler Station Wagon for a couple of hundred dollars and with $300 in my pocket, I drove across the country and landed in Los Angeles. The first thing I did was rent a small studio that I could live in. I worked a few crumby jobs until I was picked up by a good gallery. Within the year, I had my first solo exhibition. From that point on, things took off. I was exhibiting my new “Abstract Illusionism” paintings in galleries in Los Angeles, New York, and San Francisco, and numerous museums around the country. My first few years of exhibiting resulted in a string of “sold out” shows. Supported by my paintings, I worked exclusively as an artist, without distractions or other commitments. It was fun, but definitely a lot of hard work. During this phase I was still applying for teaching positions, and after two hundred applications, I was finally offered a teaching job in Arizona. For two years I commuted weekly from Los Angeles to Arizona and back. I was selling so many paintings I quit that job. I missed teaching, and a few years later I joined the faculty of the California State University system. Over a 27 year period, I worked at two separate CSU campuses, and was ultimately hired to create and direct the art department at the new California State University Channel Islands campus (just outside of Los Angeles). I worked there as Professor and Department Chair for thirteen years. In 2015, I moved to Maui and currently teach at University of Hawaii Maui College. I continue to produce my paintings, exhibit and sell through galleries. I had some life-changing professors; Trevor Bell, Jim Roche, Ray Burgraff, and Janice Hartwell, among others. Prior to coming to FSU, Trevor Bell was considered to be one of the top abstract painters in Europe. He was a brilliant artist and insightful professor. Jim Roche, a conceptual sculptor, was way ahead of his time. He just had a solo exhibition at the Whitney Museum in New York. Trevor and Jim had very different points of view about art; however, I chose to work with them both because I knew I could glean unique insights from each. Trevor was a purist and formalist. 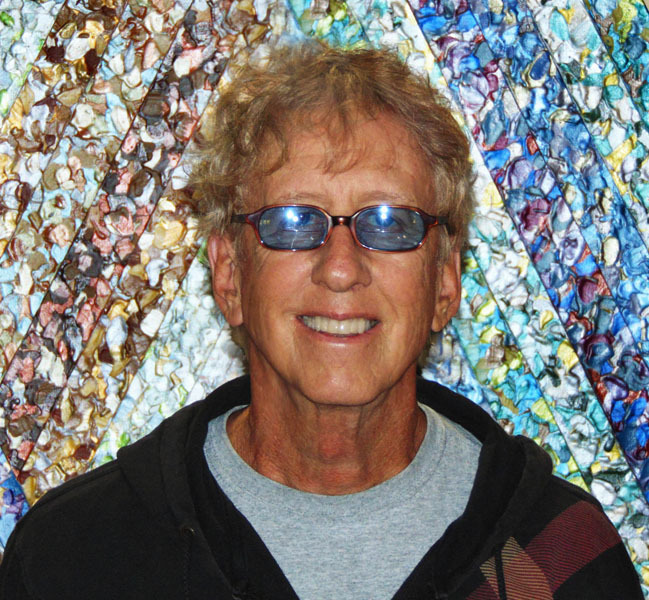 Jim was a real go-getter and deeply involved in challenging conventionalism in the art world. Ray Burgraff was a thoughtful theoretician and committed painter. Janice Hartwell was a wonderful printmaker. I learned much about contemporary art and art world issues from all of my FSU professors. I had an awesome time there, painting and partying a lot as well, but I always worked very hard on my art. 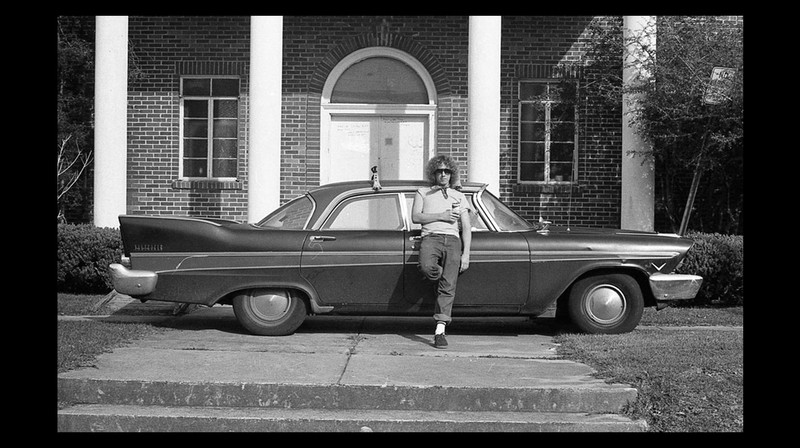 There were some unique facilities at FSU back in the mid 1970s. My fondest memory is of the old synagogue on Call Street that was converted into a studio for BFA and some MFA students. A few students secretly lived there. It was a crazy, soulful deal. When the synagogue was torn down, the huge off-campus warehouse studios were developed, outstanding facilities overall. I’ve since taught at a number of universities and private art schools in California, and in my opinion, FSU blows many of them away – the facilities, the professors, and the ambiance. The FSU art program is fabulous. I can’t speak highly enough about it. First, complete your terminal degree. To be successful as an artist, it’s all about one’s­­ ambition and willingness to work extremely hard and sacrifice regular stuff (a fancy car, buying a house, and even relationships) for their art. Plan to be poor for a while and make sacrifices until you break in. Don’t get a job that drains you of your time and energy. Spend whatever time you have networking at exhibit openings and art scene events. No matter what, always keep producing. Develop your personal communication skills and learn to interact with people, both on the phone and face to face. In the professional art world, people are serious, out there doing business, trying to make a name for themselves, and make money. Once you are out of college, you have to leave behind that lifestyle, i.e. partying, drinking heavily, etc. If you are still acting like a college kid, that won’t fly. In order to have a chance at breaking into the art world, you must have your studio in a major art center such as New York, Los Angeles, maybe Chicago. If you need to move to make this happen, then do so. Everything happens through networking. Selling art is a big part of the business. Can you name any poor famous living artists? No. So, you need a good dealer (gallery). Develop a thick skin for rejection. You won’t have the occasion to have critical reviews when you’re out of school, until you’ve landed a gallery and are exhibiting. Prior to that, all you will hear is “no” and there’s very little discussion until you finally get your first “yes.” These days it’s very easy to be rejected because much is done impersonally online and through Email. You have to get tough and keep pushing until you get a break. Then run with it. Never give up or quit, if you do, it’s “game over.” Play your cards close with dealers, collectors and colleagues. You should expect ups and downs in your career, but never speak negatively of yourself or reveal any problems with your career (or personal life for that matter). Successful artists, curators, and dealers are not interested in your failures and will quickly abandon you if they sense you are not successful or on track to be so. Everyone loves a winner!